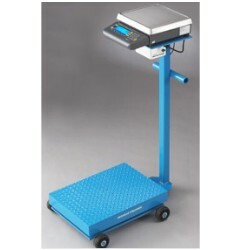 The Avery Weigh-Tronix portable floor scale (PFS) is a 24” by 18” platform scale on wheels, designed to be connected to a weight indicator. This 1000lb capacity industrial scale can be battery powered, for complete flexibility in location. The Avery Weigh-Tronix portable floor scale (PFS) is a 24" by 18" platform scale on wheels, designed to be connected to a weight indicator. This 1000lb capacity PFS 2418-01 Portable Floor Scale industrial scale can be battery powered, for complete flexibility in location. The PFS is a portable deck scale designed to interface with the Avery Weigh-Tronix Model PC-820 Dual Counting Scale. The PFS comes standard with a 12" x 14" platform with pre-drilled holes to mount a battery operated PC-820-Dual Counting Scale (or an indicator). It includes (4) rubber bumpers with nuts to hold the PC-820 in place and a DB9 connector to interface with the PC-820. There are also (4) additional pre-drilled holes designed to mount a BP-25R Battery Pack for extended battery operation.